Did you see my Instagram of these meatballs? Did you laugh? Do you like my jokes? Please be my friend. You guys know I’m on a roll with meatballs. First were my Easy Vegan Meatballs featuring tempeh, then my Sun-Dried Tomato and Basil Meatballs featuring chickpeas. I can’t leave lentils out of the party, so this is my take using green lentils! This recipe is simple, requiring just 10 ingredients and 30 minutes to prepare (when you start with cooked lentils). It’s the perfect way to utilize leftover cooked lentils in an exciting, new way. In my opinion, if you put anything atop pasta and red sauce, it’s exciting (what does that tell you about my social life?). 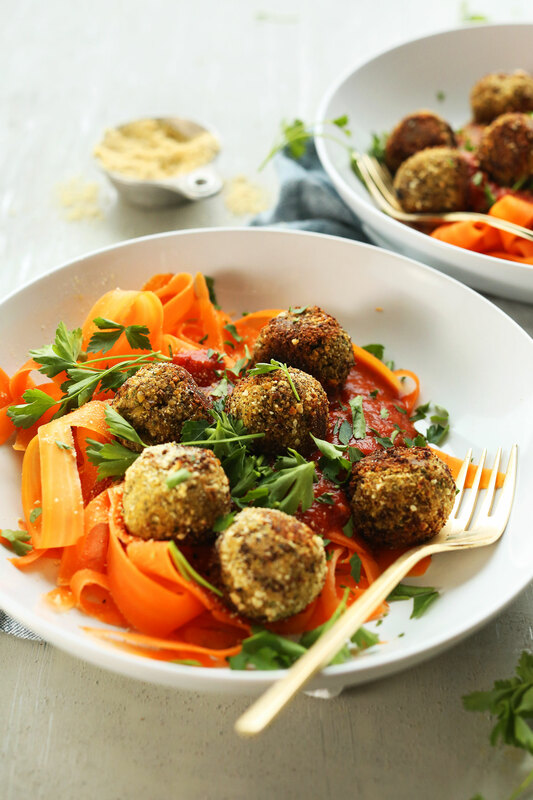 In addition to being simple, these meatballs are also vegan and gluten-free, and packed with flavor thanks to fresh parsley, dried herbs, tomato paste, and vegan parmesan cheese. They get their golden brown crust from vegan parmesan cheese and a quick sauté in a skillet, before finishing off in the oven to help them crisp up even more. While that’s happening, prepare your accompaniments. I went for carrot noodles – because, love – and store-bought marinara sauce to save time. Make these for a weeknight meal when you’re looking for something hearty that doesn’t require too much work. Per 4 meatballs, these pack 10 grams of protein! And if you pair them with a quinoa- or brown rice-based gluten-free pasta, you’ll get another 5-10 grams protein per serving. If you try this recipe, let us know! Rate it, leave a comment, and don’t forget to tag a picture #minimalistbaker on Instagram! We’d love to see what you come up with. Cheers, friends! 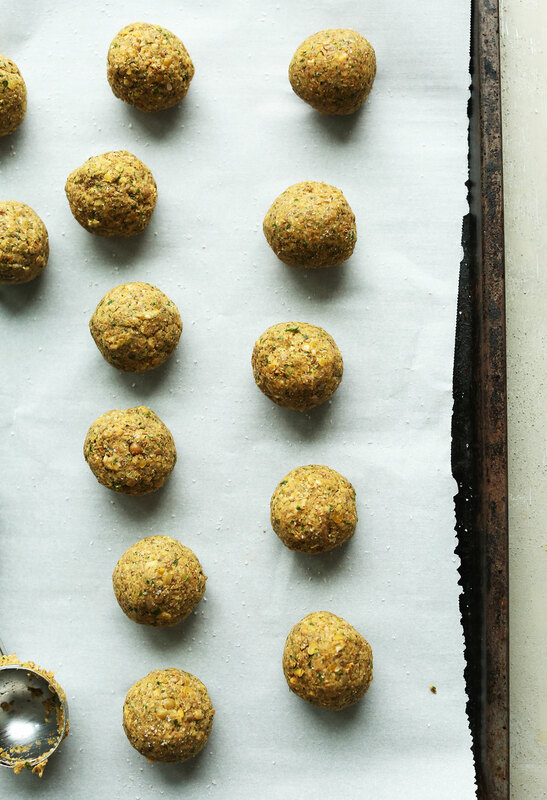 Lentil meatballs made with just 10 ingredients in 30 minutes! Savory, tender, flavorful, and perfect atop gluten-free pasta or carrot noodles! Heat a large skillet over medium heat, preheat oven to 375 degrees F (190 C), and line a baking sheet with parchment paper (or more if increasing batch size). Once skillet is hot, add 1 Tbsp olive oil (amount as recipe is written // adjust if altering batch size), shallot and garlic. Sauté for 2-3 minutes, or until slightly golden brown (being careful not to burn), then remove from heat and turn off stove top. To a food processor, add flaxseed and water and let set for 2-3 minutes. Add cooked, cooled lentils, 1 tsp olive oil (as original recipe is written // adjust if altering batch size), sautéed garlic and shallot, Italian seasonings, parsley, tomato paste, vegan parmesan cheese, and a pinch each salt and pepper. Pulse, mixing until combined, but not puréed, leaving a little texture. Taste and adjust seasonings as needed, adding more salt and pepper or herbs for flavor, vegan parmesan for cheesiness and to dry out, or more olive oil to moisten. The texture should be dough-like. If the mixture is still too wet, add coconut or oat flour, or panko bread crumbs if not gluten free. Use a Tablespoon or cookie dough scoop (like this one), to scoop out rounded Tablespoon amounts of dough and carefully form into balls. The mixture is moldable, but fragile, so the best way to do this is to rest the dough in the palm of one hand, while using two fingers from the other hand to gently mold/form into a meatball. If it cracks, moisten your fingers with a little water to help reform/bind them. Repeat until all meatballs are formed - about 12 or 13. Roll/coat in vegan parmesan cheese (optional) and arrange on baking sheet. Heat the skillet from earlier over medium heat. Once hot, add 1 Tbsp olive oil and half of the meatballs (amounts as original recipe is written // adjust if altering batch size). Brown for 4-5 minutes, or until golden brown, shaking the pan or using a wooden spoon to roll the balls around to cook evenly on all sides. As they are done cooking, transfer to your prepared baking sheet and set in the preheated oven. Repeat process, adding remaining 1 Tbsp olive oil (amount as original recipe is written // adjust if altering batch size) to the skillet and sautéing remaining meatballs, then transfer to oven and bake for 10-15 minutes, while you prepare your carrot noodles, pasta and/or marinara sauce. Remove meatballs from oven and let cool slightly - they will firm up the longer they are cooled. Serve over carrot noodles or pasta with marinara sauce. Best when fresh, though leftovers keep in the freezer up to 1 month. Reheat in a 350 degree F (176 C) oven until warmed through. *3 garlic cloves is equal to ~1 1/2 Tbsp minced garlic. *If not gluten-free, add 1 Tbsp panko bread crumbs (amount as original recipe is written // adjust if altering batch size) to the filling instead of coconut flour, and mix it with vegan parmesan cheese to coat the outside before cooking, as seen here. This will add a little more texture and flavor! *Nutrition information is a rough estimate calculated with the lesser amount of vegan parmesan cheese and without optional ingredients. These are amazing! I love them every time and the flavor is perfect! I eat them plain a lot- or with quinoa. Great for vegan momma and toddler! This looks amazing! I’m wondering if you can use any type of lentils? In general with the different dishes you make with lentils does it have to be the specific one you link to or can it be a different one (black lentils, green, red, etc)? Made these for the first time. I only wish I tripled the recipe because they were soooo good! 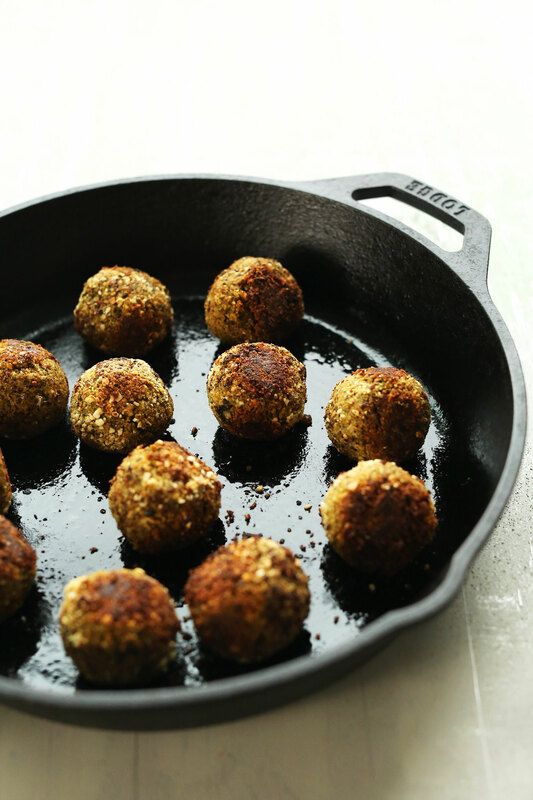 I’ve made a couple meatless ball before but these are perfect. Flavourful, easy to make and stick together beautifully. I followed the recipe exactly – had no issue with the flax “egg”. I’m always looking for good appetizer ideas for a party. Think I will try this one next time I have a party with a side of marinara dipping sauce. Will definitely make again! So glad you enjoyed these, Lise! Thanks for the lovely review! Thanks so much for sharing.. the lentil meatballs were better than I imagined.. They were so good I’m mad I hadn’t tried it before now.. The best recipe ever.. ❤️❤️ I always make a huge pot of lentils but after a few days I’m tired of eating them. Now they will NEVER go to waste. I have made these a few times and love them (with real eggs, the time I tried flax egg it did not work). Delish!! Hi these look delicious. I have a question. I don’t have a food processor but I have a vitamix and a potato masher. Could I use either of these instead? Thanks. Hmm you could give it a shot, though we can’t guarantee the results. Let us know how you make out! These were bomb! I have never made lentils before so I cooked them in my pressure cooker for 10 min on High after sautéing onion and garlic in olive oil and added veggie broth in place of water. Then I strained and cooled and followed the directions. I didn’t have a food processor so I just put everything into a large bowl and used my potato masher. It worked beautifully. It was crazy how much it looked like meat. I also added worsteshor sauce and used both panko and bread crumbs. And totally spaced the flax egg so that got omitted. Rolled them into balls. Pan fried them and then baked them. Absolutely perfect. My husband eats meat and made sausage meatballs for himself and couldn’t stop eating my meatballs!! Thank you! Add o disapointed. Th o moist. After reading other reviews about lack of flavor. I added bay leaf , garlic, Italian seasoning. Recipe was tasty, too moist. We tried rolling them in bread crumbs. Better but a big fail. We served them with linguine, veggies and sun dried tomatoes. I will keep searching for the perfect recipe. Just a question. Do you mean 1 1/2 cup dry lentils and then cook and cool them. Or do you mean they should measure 1 1/2 cups after they are cooked? 1 1/2 cups cooked + cooled green lentils. My only real problem was the meatballs fell apart and it ended up being a meatball scramble BUT no one minded and it tasted just fine. 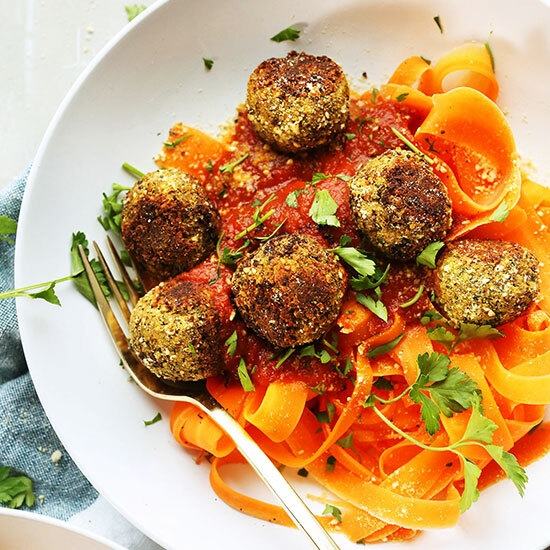 I’m curious about making vegan Giant meatballs, like one meatball crowning a bowl of spaghetti.. any advice on how to tweak the cooking time to allow for this? I assume I’d sear them in a pan but then just transfer to a lower heated oven and cook for longer, but I’m not sure! Thanks! Good day, I am from South Africa. Vegan parmesan cheese isn’t available here. Can I just leave it out? Or should it be substituted? If yes, any suggestions on how? Hi Chantell! I’d just leave it out! Delicious! the batter was too wet so i just dropped spoonfulls of it on the baking sheet and it came out delicious and so flavourfull! i skipped the parmasan cheese. How much dry lentils do you use to make 1 1/2 cup of cooked lentils? Hi Debbie! 1/2 to 3/4 cups of dry lentils! I made this tonight and the meal was delicious! They were actually lentil patties instead of meatballs but my family didnt need to know that! I accidentally put too much water in my blender when the mixture was too thick to blend. Still turned out very tasty especially with the vegan parmesan cheese. Glad to hear it, Joy! I have a question, do you think these would hold up if added to a soup at the last minute to serve? I really want to try a soup with them but I’m afraid they’ll get soggy and fall apart. Thanks! While they will not be as crispy, that should still work. Subbed basil for parsley and chia for flax- amazing flavour, texture and taste! Seriously tasted like MEATballs! Just made these meatballs! So flavourful! Wonderful recipe! My husband and I literally ate these saying “mmmmm”. So yummy!!! Thank you for the recipe! I had some green lentils that I needed to do something different with and came across this recipe. I found the lentil balls to have a little flavor on their own but will definitely be better with some sauce. I made them as instructed, but when I make them again – Yes, I plan to make them again. – I will probably add a little more panko to hold them together better. Maybe I’m looking at this wrong? But the calories per serving look like they are per meatball? Right? I can’t figure out how that would be 243 calories per meatball. I plugged everything into MFP and got ~80 calories per meatball. What am I doing wrong? I can’t comment on how good it is because I’m just getting ready to make it now! But I’m sure they’ll be great, like all your recipes!! My kids devoured them!!! Huge hit! I served them with zoodles and a capers salad on the side. Great dinner, thank you for the recipe! Woot woot! Glad to hear it, Suba! I made this for my vegetarian mom and boyfriend. Both are pretty picky about faux meat type meals and stick to store brands. I made these balls and they were a hit! They even asked me to make them again. I am gonna make a double batch and leave them in the fridge for emergency pasta nights. I never remember to use the cheese but they taste fine without. These were great!used the pre-cooked lentils in the vacuum pack from Trader Joe’s to make it easy. I didn’t have tomato paste so I used a Tbs of tahini annnnd served over carrots and steamed spinach. So goood?? I really want to make these tomorrow but have no desire to fry them…just bake as we are a low oil household for my health. Do you think baking them a bit longer would work just the same to cook them/keep them together? Hi Laura! While they will not be as crispy, that should still work. This recipe was fantastic tasting. I did end up putting breadcrumbs in it to make the balls stick together a little better, but this recipe is worth the try. Tastes similar to Italian sausage. So I love the flavor and everything about these except mine stayed mushy even after being cooked. They kind of smushed and fell apart. Any advice? I’d like to use the recipe as a staple. Hi Nicole! These “meatballs” are a bit more tender than say a chickpea meatball, but making sure they are very well puréed/mixed and then drying out with bread crumbs to the point of a firm dough should help! I would also think refrigerating them would help! Hope this helps! Delicious! Even the uncooked mixture was so good that I kept some of it aside, spread it on toast and topped with sliced avocado, vegan lime crema and hemp hearts. Two meals in one! Thanks for the great recipe! Great Sunday night recipe! 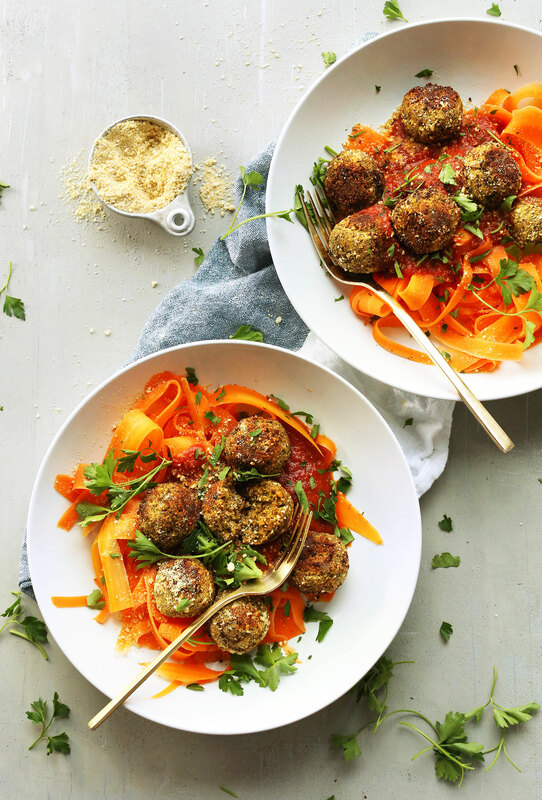 I’m a big meatball lover but this is refreshing and lighter – also very filling! I will be using canned lentils. How in the world do I cook them so they are not mushy for this recipe?? Just follow the directions as written in step 4, as it calls for cooked and cooled lentils and use your canned lentils from the can! Question about the amount of lentils. Is it 1.5 cups of cooked lentils or 1.5 cups of dry lentils (that would then be cooked). If it is 1.5 cups of cooked lentils, about how much dry lentils would I need to cook? Hi Kenda! It is 1.5 cooked lentils so that is 1/2 to 3/4 cups of dry lentils! I’ve made these several times, most recently for a party, and they are a huge hit with both my vegetarian friends and the meat eaters! I was wondering if you had made a version of vegan meatballs that could go with any sauce before? Your website and your food are so great, so I’d love to try any suggestions from you! These are amazing! I’ve made them twice in the last few weeks. The first time they were better, and I think it’s because I didn’t cook the lentils well enough the second time so they weren’t as easily kept together. But they are BY FAR the best homemade veggie balls I’ve ever made. I served them with pasta and red sauce both nights (of course, with your parmesan!). Will be my go-to recipe for veggie balls for sure. A bit wet is an understatement. Yes, I drained my lentils. I got tired of adding more and more dry ingredients. The meatballs formed nicely, but “melted” as they heated up. Basically got a fried lentil mash. Tasted good , but was frustrating to make. I’ll go back to my lentil and walnut recipe. 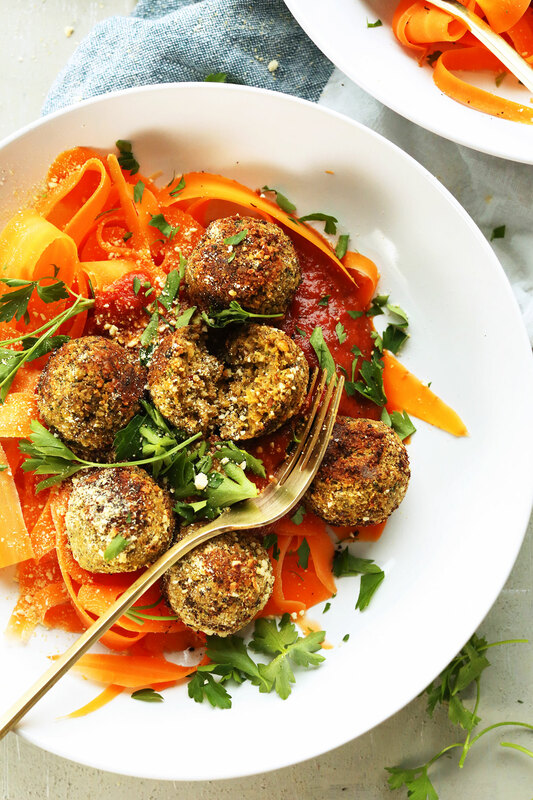 Love the idea of lentil “meatballs”! Made this tonight and the flavours are spot on delish! The only thing is it really did take a lot of fiddling with to get the consistency right. I had to add maybe 3tbsp almond flour and 5 tbsp panko until I could even make balls. Followed the recipe except used egg instead of flax egg. Would definitely make again but made a mental note about the softness. Would these work with red lentils? Hi Sherri! That should work! Just ate my first round of lentil-balls… well, they kind of turned into lentil-pattys… whatevs, they were awesome! Even the neighbor kid wanted in on them. My wife wanted to tell you, “I like when my house smells delicious”. This was so delicious. I didn’t make the carrot pasta, saving that for another day. But made the meatballs as instructed. I used Brown rice pasta and I made my own homemade sauce which is. Diced onion, minced garlic, sauteed. Add large can crushed tomatoes, 1/4 cup chopped fresh basil. 1 tsp dried basil, pinch of sugar (battle the acidity of the tomatoes) grated nutmeg and 1/4-1/2 tsp of red pepper flakes. I could never tell I was not eating the original meatballs that I used to make. They were tender and so were these! Thank you again for another hit! I made these tonight and the flavor paired perfectly with pasta sauce! The only thing I was wondering about is whether they’re supposed to be so soft on the inside? The outer most layer is firm because of the sauté in the pan, but it’s almost like the inside didn’t firm up at all in the oven. This comment isn’t specific to this recipe but I just thought I should say thank you! I bought your book and everything I have EVER made from it or the blog has been delicious. Whenever I am looking for a recipe of something specific, yours always comes up first and I am so happy to give them a go! I always recommend your recipes to friends and tell them that I actually have trust in you because I know everything will always be yummy. Just thought I should let you know! PS, currently eating this, it’s amazing. Smelled like pizza when I cooked them! I had to add flour and then coat them in a little flour. They were so mushy and sticky. I think next time I will add some oat flour. I made these for dinner last night. When I went to make the balls, they were very light so I only fried them in a tsp of oil on two sides until brown to get a little crispness then baked them in the oven. I used two chopsticks to turn them over. We ate them on a bed of spaghetti squash and marinara sauce topped with some of the leftover vegan parmasen cheese. They were delicious! I wish I would have remembered to take a picture. They did take me a little longer to make as I had to cook the lentils, bake the squash and make the Vegan Parmesan cheese. Well worth it. My husband even liked it and he was raised a meat & potato boy who never cared for lentils! Hey Dana – you’re so sweet and funny, and it seems appropriate that your name Dana in the language of the Buddha, Pali, means the practice of giving … you’re on a roll with meatballs ha ha ha, and another joke on the post … there was that joke I think on your instagram link, a bit rude maybe but so funny, if you’ll forgive my quoting it “your balls feel so good in my mouth”!! I think … I can’t laugh, as we say in The Bahamas … we have a group here called Hands For Hunger and they had a challenge to live on $4/day for 4 days to help build empathy for those who have to live within that budget all the time, and your Vegan Lentil Shepherds Pie is so delish and works out to $1.40/serving in Bahamas (and it’s a big serving), and everyone I shared it with loved it! So I will try these lentil balls, and your other recipes too, and thank you … kind regards, Lester. Really tasty and very simple! We didn’t use the parmesan and they were still great – they have even a meaty texture almost! delicious! Made these tonight – absolutely wonderful! I did roll them in parm before frying. They held together great and have a good flavor. Served over gluten free spaghetti with a homemade red sauce. We gave up sweets and meats for lent. These sure hit the spot! Hey I was just wondering if the flax egg is necessary or whether I could just use my normal egg replacer? I think that would work too! Help…mine came out soggy. flavor is good but not the texture…how can i fix them?i don’t want to waste. I’m gluten free…add more breadcrumbs? lentils? egg? Hi Tiffany! I am sorry to hear that! Add more breadcrumbs! I made these and they were delish! Though, how do you get the balls to not stick to the pan? Parchment paper should do the trick! Thanks Liz! These “meatballs” are a bit more tender than say a chickpea meatball. But making sure they are very well puréed/mixed and then drying out with bread crumbs to the point of a firm dough should help! I would also think refrigerating them would help! OMG These are absolutely amazing!!!! Thank you so much for always posting such yummy recipes!! You are the best!! I made these and they were delicious. However I felt it was overly fussy to have to bronw them in the skillet and THEN put them in the oven. I would also disagree that these are 10 ingredients or less since I also had to make the vegan parmesan. Even without the vegan parmesan, the idea of making this within 30 minutes was completely false advertising. I would give these 2.5 stars in terms of delivering the cooking experienced that was promised, but because they taste very good I’m giving it 4. I just want to tell that I made two ENORMOUS batches and froze them. Last week I made one and it just wasn’t enough for everybody hehe! We ate them with pasta, in falafel-style wraps, with rice! I absolutely love love love them!! Thank you for the delicious recipe! This recipe is so wonderful! I made these on a bed of mashed potatoes smothered in a cashew cream sauce…it was perfection! Every single recipe I have tried from you turns out wonderful, thank you for inspiring me to cook more! Even my toddler liked the flavor — he got all excited the second he saw me making your vegan parmesan cheese! These are YUM! Love the flavor profile :) They took me longer to make but that’s because I had to cook and cool the lentils first. All in all a good experience and would make again! I made these and was surprised at how flavorful they came out. Thank you so much for this easy and awesome recipe! I do mine similar but I don’t add any oil, I bake not fry mine. With homemade spaghetti sauce and zucchini noddles, our kitchen kiddo loves this dish. Another great recipe! I skipped the whole frying bit, and instead just baked them (saved me a step, plus ended up lighter without the extra oil) and they turned out really good. Baked them for about 25 minutes at 400, and flipped them half way. Tastes great with homemade red sauce and spaghetti squash! I followed the instructions, but my meatballs fell apart in the pan. Any suggestions? Another reader had the same problem and ended up just baking them! They might not be as crispy, but it might be worth a shot! See previous comments for more tips! Incredible recipe! My daughter and I just made these and we just love the flavor. I didn´t take that extra step of frying first and then baking (due to lack of time) but they still came out delicious! I tripled the recipe and have lots to freeze for weeknight dinners. Delicious nutritious recipes! Thank you! I only have red lentils on hand at home, do you think these would hold up just as well as green lentils? Hi Samantha! Red lentils do vary in texture in comparison with green, they tend to get a little mushy after cooking, but I think they’ll still work! If you have trouble with the consistency, try adding coconut or oat flour or panko bread crumbs! Absolutely delicious! Couldn’t stop tasting it especially when it was time to clean my hands… LOL. Well lets see… I actually ended up making two batches because I started with 1 1/2 cups of uncooked split peas… should have read the comments before getting started as I now see others did the same. My second batch held together better than the first even though I forgot to include the flax egg possibly because 1/4 cup of oat flour on the second batch. I can’t wait to try this recipe again… I also used cayenne pepper. Just tried this recipe, along with the carrot noodles, and oh my gosh so good and delicious! Thank you for this yummy recipe. Loved this recipe! It was a little bit more time consuming that I thought, but I’ll still make them again because they were so good. For the “Parmesan cheese,” I subbed cashews with sunflower seeds per a comment on that recipe because I’m not a fan of cashews. Thanks for posting this! You’re such a great chef!! Mine came out somewhat flat after I took them out of the oven… did this happen to you? I reshaped them once out and they were delish. But was sure if this was supposed to happen or not! These are delicious and I’ll definitely make them again; however, I learned my lesson on reheating as I left them in too long and they dried out. Thank goodness for the marinara sauce to moisten them back up! Do you think these would work well in like a bbq meatball? I used to love cooking meatballs in the crockpot with bbq sauce, I was thinking of tossing these with some bbq sauce in a pan for just a few minutes and wondering if it would work. Thanks. Perhaps! If you give it a try, let me know. These are a little tender, so maybe going easy on the sauce would be good. I want to make these for a large party, but am confused by your yield measurements. You say that 1/4 of the recipe = 3 balls which mean that the entire recipe only makes 12 balls?? But, you say it should serve 12-13 people; what am I missing?!!! Thanks so much! I made them and the recipe does make 12 balls. So 4 people if they each get 3. These were delicious, my favorite vegan meatball that I’ve made! My 2 year old gobbled up a few too. Thank you! I’ve made this a few times now, and it’s always so good! The only issue I ever have is the step of cooking the meatballs in olive oil on the skillet before baking. Last time I tried it, they just started to fall apart and I had to stop a minute in. This time I just baked them an extra five minutes. Very tasty and very easy. Fell apart instantly upon cooking. I made these last night! Super yummy!! I cooked my lentils in veg broth (as suggested) with a few fennel seeds, a bay leaf, and 2 smashed garlic cloves to give the lentils an extra boost of flavor. I served it over brown rice spaghetti with marinara sauce. I made the recipe as written with the addition of whole wheat panko crumbs to bind it a bit more. I did not coat the meatballs with the “Parmesan” and instead just made 12 small patty type burgers. I brushed light olive oil on a cookie sheet covered with parchment paper, placed the patties and brushed the olive oil on top as well. I baked them for about 15 min in about a 375/400 degree oven (my oven is a bit off) and then flipped them. They came out slightly crisp on the outside and soft on the inside. I liked the texture but for me the Italian seasoning was a bit too much. I ate them for lunch with Hummus and they were yummy. I will make them again but adjust the seasoning more to my taste. Thanks for another great recipe! Thanks for the feedback, Reva! Glad you still enjoyed them. Finally a vegan meat sub. with common ingredients!! Our house we have crazy allergies. We have to avoid dairy, nuts. I dont eat meat, processed foods have hidden no-no’s. I LOVE that I don’t have to p!an a special grocery trip to the “Wholly Expensive” store. Lol! I followed the recipe exactly ingredient wise but made burgers. It made 6 burgers that are about the size of quarter pounders. Yum!!! HaRd not to eat them before dinner!! Just finished a Sunday lunch of angel hair pasta, store bought marinara and these heavenly lentil meatballs, topped with vegan Parmesan. (I make my parm with just pepitas/pumpkin seed, garlic and salt. Heaven!) I screwed up and these lentil balls were still to die for. I only have dry lentils, and mistakenly used 1 1/2 cup dry, which cooked up to a WHOLE LOT of cooked lentils — all of which I threw in the cuisinart with the herbs and spices, not checking the photos. The spices seemed uncharacteristically lacking Dana’s BIG flavors (Do ya think I got that clue? Nope! ), so I added more until they had that “Dana” taste that we love. Thirty (yup — 30) meatballs later, I am in love — and so is my husband! They look and taste good enough to totally fake a carnivore out. I’m going to freeze the leftovers first on the tray they are on, then plop them in a freezer bag. I may stick with big batches in the future — they taste so incredible, they won’t last long in our house. Another winner, Dana — thank you! Nice recipe! I sautéed mushrooms with the onion/garlic mixture for a more meaty texture– will definitely make again! Thanks! Thank you so much for this amazing recipe, Dana! These were amazing! I used fresh basil and parsley instead of dried herbs. So flavorful! I’ll definitely make them again. Jess Jo, of course! I allow myself eggs and dairy because I feel they don’t harm the animals. I like vegan options so that I learn how to make them. I would add an egg for part of the binder. Just my opinion. I know they will be great. I’m having some Basmati rice with lentil balls and tomato sauce with some vegan parm and hot chili peppers. YUM! thanks Dana for the foundation of a recipe that will be in my collection for a long time. Loved this recipe! I was a little wary at first seeing that they went from the food processor to the frying pan to the oven…simply because after work I prefer a “one and done” recipe when it comes to cooking, but these truly were awesome! Each step had the “minimalist baker” spirt and were simple and totally worth it. The leftovers were great too… just popped them in the toaster oven, and they were perfect! Thanks, Dana, for another great meal! Great recipe! Was delicious! I used red lentils instead as the cooking time is shorter. Can you simply bake them instead of pan frying, THEN baking? I am going to try this and let you know. ? I can’t say enough amazing things about these “meat”balls. They are so easy to make that they’re hard to screw up–not an easy feat with recipes that are both vegan AND gluten-free. I have already made them twice: once with good old marinara and pasta and the other (at my partner’s request) to put on top of pizza. So delicious! They hold together perfectly after cooking according to directions, and they are so satisfyingly savory. I haven’t eaten meat in years, but my recently vegan partner says that they are a flawless substitute. Such a helpful recipe! Thanks! We made them VEGAN so no cheese – used 1 x can red lentils, cumin (1 1/2 desert spoons) rather than specified herbs, and Organ egg replacer (4-5 desrtspn) and also put grated carrot and coconuts in the mix (1 1/2 cups); served on a bed of peeled carrots with rice pasta (great idea for adding colour!) Our vegan balls were rolled in chick pea flour, then panfried them (6/10 heat mark) in lots of pure virgin olive oil, (10 minutes turning twice) and then quickly transferred into a second pan of reheated chopped tomatoes(tinned). Sprinkled with the parsley. Chilled balls next day were great for a lunchbox! I added grated Zucchini since I had some left. Made these last night and they are A-mazing. 5 stars! haha I also get excited when I can add something to my spaghetti! 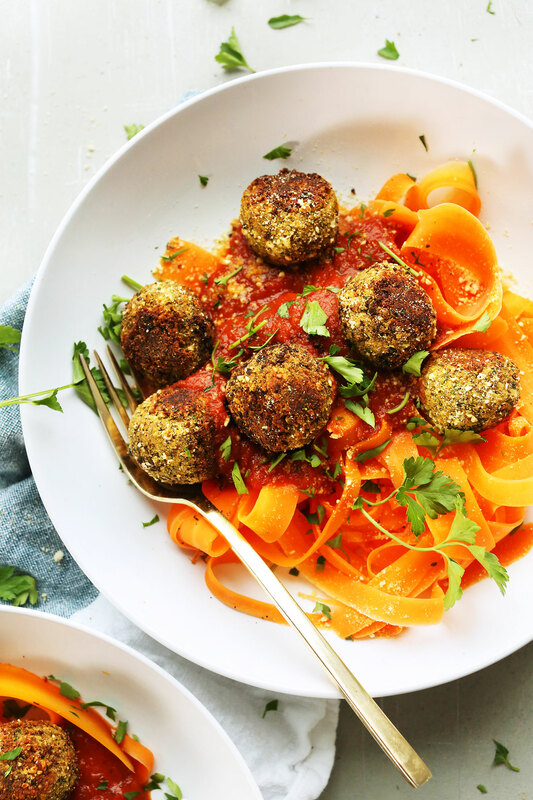 I love this take on faux meat balls and using carrot noodles! You think you know, but you have no idea how amazing these are! My non-vegan husband stole my “meatball” off my plate! Thank you! Is there any way to substitute the vegan parmesan cheese? My grandson has nut allergies, so the vegan parm with cashews isn’t an option :( Any suggestions for a sub? Maybe ground flax with nutritional yeast? Delicious! I added some mashed sweet potato and used a tin of brown lentils to keep it as easy as possible and use what was in the house. It was a bit wet so used some breadcrumbs too. Also, didn’t bother with the oven, just fried and added to some tomato pasta sauce on the stove. So yummy! Thanks. Just made these lentil meatballs tonight. They were absolutely delicious. My mixture came out wet, so I added some flour and breadcrumbs as suggested. Will be making these frequently. Thank you for another wonderful vegan recipe, Dana. Looks so delish!!!! I really have to try these. 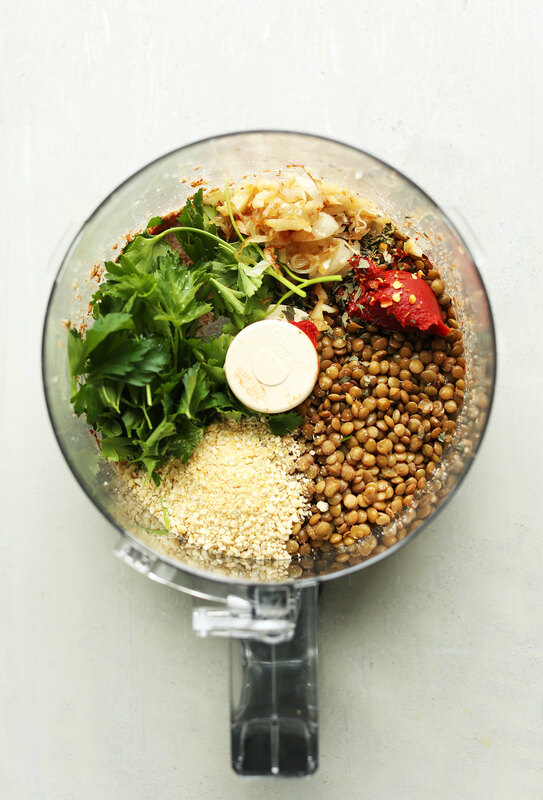 Could you please recommend me a food processor? It’s been a while since I wanted to get one. Wow, definitely going to try these – they look wonderful! You had me at lentils <333 Keep the lentil recipes coming! They're probably one of my favorite ingredients to cook with. Can't wait to try these! These came out great! I swapped lentils for mung beans and omitted the parm, baked in the oven, then smothered with homemade tomato sauce. I have to admit that Mung Bean Meatballs has a nice ring to it! My daughter doesn’t like the word “meat” in there so we called them Mung Bean Balls. Thanks Dana! I’m not really a pasta-person (usually too much dough and not enough veggies), but I made this today with carrot an zucchini noodles and I absolutely loved it! Prefect combination :) Thanks for yet another great recipe! Thanks so much Dana for always posting such great recipes with beautiful photos and (John) for lots and lots of great blogger tips! This is absolutely fabulous! I am going to make them this weekend. I love anything with lentils-great post!! Carrot noodles!! Ah they are so delicious and beautiful! Love these meatballs too dear! So wholesome and hearty. Since I help organize a Vegan brunch-style potluck kind of thing in my hometown I’d like to ask you if this recipe or any other of your glutenfree vegan meatball-style hearty recipes is suitable to be eaten cold? Or what would you recommend to bring to a Brunch with about 60 people where you are not able to heat the food up? I brought potatoe salad, hummus, lime cafe and all the obvious stuff already and now I’m running out of ideas because nobody adds to their burger / meatball recipes if they taste good when eaten cold. PS: I do so hope meatballs with millet are up next! These look wonderful! I also did see them on the Instagram. I can’t wait till your book comes out so I can have time to cook cool meals when I get out of work! You seriously ALWAYS have the best recipes – both savory and sweet. If you can’t do yeast do you have a substitute? You can try leaving it out, or adding more garlic powder? Ok. I usually leave it out. My diet is Satvic vegetarian. Absolutely no yeast and mushroom and only use garlic and opinion sparingly if not at all…so need some adjustment in lots of recipes. I any case, want to get your new book- I imagine there will still be a lot to take from it. Just found your site: family loved coconut ice-cream and almond butter tofu in vietneamese wraps :) You absolutely deliver! I love how simple this recipe is- especially compared to store-bought veggie meatballs. Do you know if they freeze well? I think they would freeze great. You could either freeze them unbaked or baked, up to you! Thank you for your recipes. We’re not a vegan home but I am trying to remove as much animal product from our diet as possible when we’re at home. And I love everything of yours I try. Your sweet potatoe black bean burger is simply divine. We made 50 sliders for my youngests first birthday party and they were a hit. I sent a link to your recipe to 7 families. They also freeze well. I make a triple batch and always keep them in my freezer for an easy and wholesome meal for my family and to give away when friends need a little extra love. Lovely! Thanks for sharing, Randee! Wow! You are amazing! You seem to always send out the exact recipe I need at the time! Love these! Whenever I need inspiration or a certain recipe your email seems to arrive with exactly what I need! Kinda spooky at times. I usually have what I need on hand! Hi! I was wondering, do you have a recipe for Hello Dolly bars? They are my families favorite, but they are full of refined sugar and dairy! I’m not sure I know what that is! Can you give me more info? I’d be happy to add it to my list! I’ve been making your simple meatballs with lentils this whole time – me and tempeh aren’t friends. This recipe validates me. And I’m gonna eat this for dinner over pasta topped with, and this may be kind of weird, mushroom gravy. Like a tasty vegan stroganoff-ish thang. I’ve never had meatballs in a very long time! They’re generally very hard to make, and to stop eating! I love your recipes and your approach to food in general. Even though I am not vegan, many of your recipes appeal to me and find their way in some form into my meals. I have one teeny complaint about your website though – hope you can hear me and not be offended. Your pictures are wonderful but because there are so many they take a long time to download. Not all of have have very fast high speed internet – I live in a rural area where high speed just isn’t the same as it is for big cities. It take more than a minute to load each of your blog post pages and I am wondering if there is anything you can do about that. No offense taken! I like to include several photos to demonstrate step-by-step instructions in most recipes. Sorry if it takes longer to load, but overall I think it benefits people making the recipes. Thanks for the feedback! Can’t wait to try these tonight, I made your tempeh meatballs a while back and they were delicious! Thanks for the wonderful recipes. FAB! Can’t wait to try these :) Also, carrot noodles all day every day! Right?! So good! Hope you love it, Samantha! Ahhh balls are the best! I love lentils and these sounds peeeeeer-fect! Those balls look great, girl.